Calculate NDVI using NAIP multispectral imagery in Python. Describe what a vegetation index is and how it is used with spectral remote sensing data. Export or write a raster to a .tif file from Python. You will need a computer with internet access to complete this lesson and the Cold Springs Fire data. A vegetation index is a single value that quantifies vegetation health or structure. The math associated with calculating a vegetation index is derived from the physics of light reflection and absorption across bands. For instance, it is known that healthy vegetation reflects light strongly in the near infrared band and less strongly in the visible portion of the spectrum. 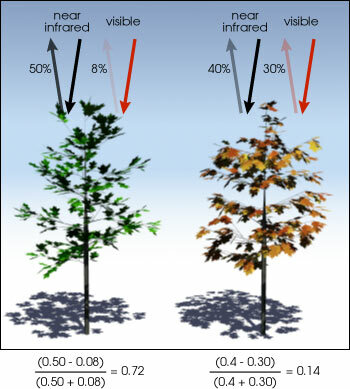 Thus, if you create a ratio between light reflected in the near infrared and light reflected in the visible spectrum, it will represent areas that potentially have healthy vegetation. The Normalized Difference Vegetation Index (NDVI) is a quantitative index of greenness ranging from 0-1 where 0 represents minimal or no greenness and 1 represents maximum greenness. NDVI is often used for a quantitate proxy measure of vegetation health, cover and phenology (life cycle stage) over large areas. Sometimes you can download already calculated NDVI data products from a data provider. However, in this case, you don’t have a pre calculated NDVI product from NAIP data. 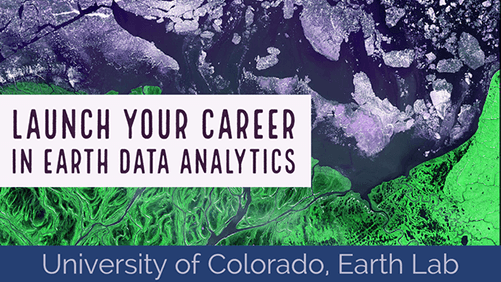 You need to calculate NDVI using the NAIP imagery / reflectance data that you have downloaded from Earth Explorer. The normalized difference vegetation index (NDVI) uses a ratio between near infrared and red light within the electromagnetic spectrum. To calculate NDVI you use the following formula where NIR is near infrared light and red represents red light. For your raster data, you will take the reflectance value in the red and near infrared bands to calculate the index. You can perform this calculation using matrix math with the numpy library. To get started, load all of the required python libraries. Calculate NDVI using regular numpy array math. In this case, the bands you are subtracting come from the same data file. The tif file format requires that all layers are in the same CRS and of the same size so you assume the data line up. Thus you do not need to test the data for equal shape, crs and extent. Finally plot the data. Note below that the vmin and vmax attributes are used to stretch the colorbar across the full possible range of ndvi values (-1 to 1). Plot of NDVI using 2015 NAIP data - before the Cold Springs Fire. Using a histogram, you can view the distribution of pixel values in your NDVI output. Histogram of NDVI values derived from 2015 NAIP data.